Cooke and Wheatstone patented their telegraph on 12 June 1837 and tried to interest the London & Birmingham Railway in it. Tests were carried out between Euston and Camden, but nothing came of it. The Great Western Railway did take it up and used it between Paddington Station and Slough. When the Electric Telegraph Company was formed in 1846 Cooke and Wheatstone sold their patents to and became Directors of the company. 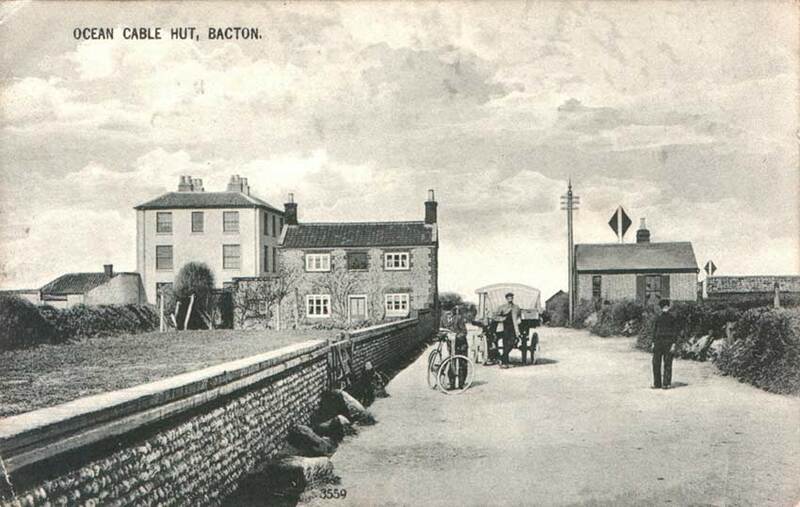 It was the most successful of the private telegraph companies in the UK., owning 10,000 miles of line by 1868. The International Telegraph Company was set up in 1852 after landing rights for a cable between England and Holland had been negotiated. It was formed after objections by the Dutch PTT to the Electric Telegraph Company operating telegraphs on Dutch soil. The company had obtained wayleave from the Holland Railway Company to set up a line to Amsterdam alongside the railway. The company decided to lay the cable itself and acquired a small vessel named Monarch and fitted her out for the task. To avoid problems with the cable being damaged by ships' anchors four separate cables were laid, being combined only at the shore ends. The cable gave considerable trouble and was eventually replaced in 1858 by a cable manufactured by Glass, Elliot & Company who used CS William Cory to lay it. In 1854 the Electric Telegraph Company and the International Telegraph Company merged to form the Electric and International Telegraph Company. After the merger other cables were laid. 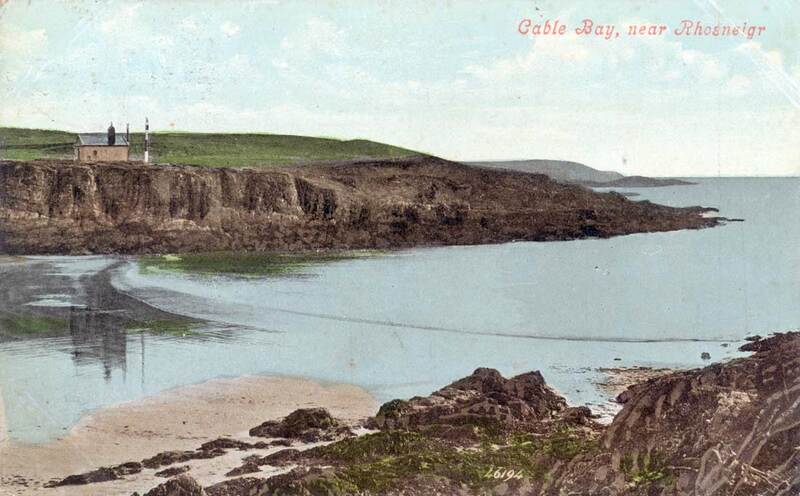 In 1854 an attempt was made to lay a cable from Holyhead, Wales to Howth, Ireland. The lightweight cable was manufactured by Fenton and Hyde but the expedition failed. In June 1855 R.S. 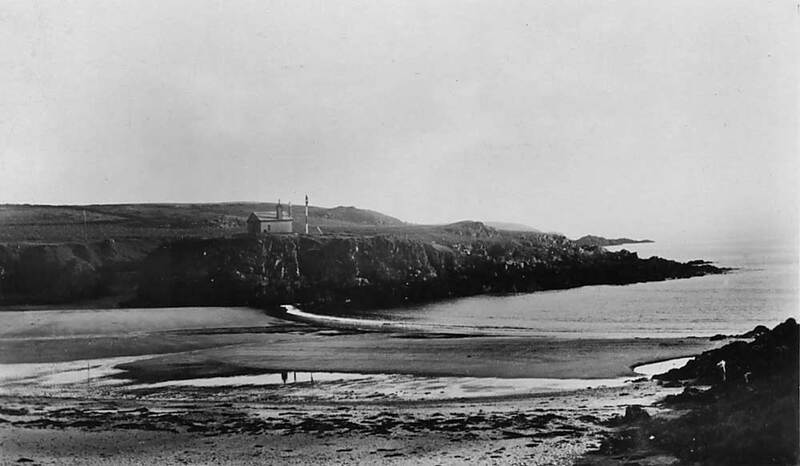 Newall & Company successfully laid a cable over the same route; its construction was similar to that laid between Port Patrick and Donaghadee for the British & Irish. 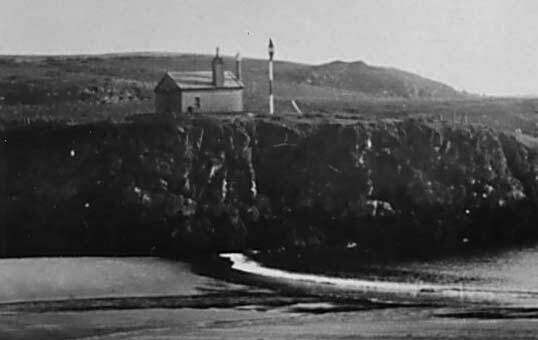 In 1857 a subsidiary, the Channel Islands Telegraph Company, was set up to lay a cable between Weymouth, Alderney, Guernsey and Jersey. R.S. Newall & Company was awarded the contract and they used their own ship CS Elba to lay it. Two other cables were laid before the GPO takeover, one in 1862 between Wexford, Ireland and Abermawr, Wales (anglicized to Abermaur, laid by CS Berwick; the other from Lowestoft, England to Zandvoort, Holland, laid by CS Hawthorns. Both were manufactured by Glass, Elliot & Company. Despite the different descriptions above, these two views are of the same building, taken from each side of the beach (Porth Trecastell, known locally as Cable Bay). 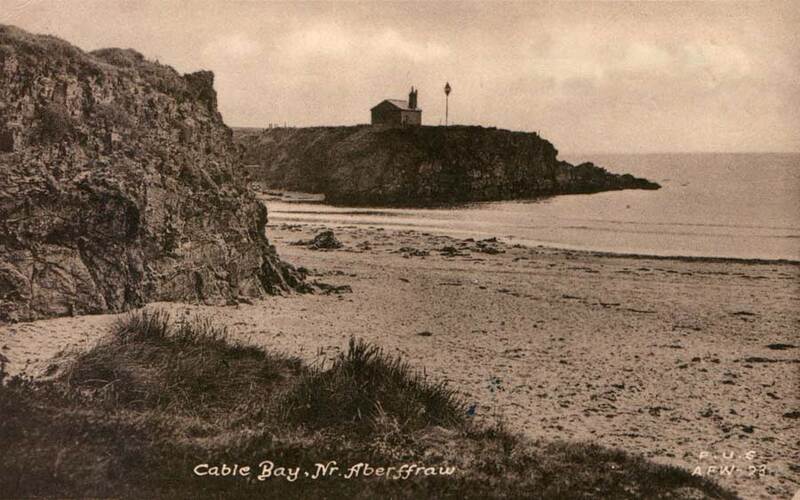 This is midway between the villages of Aberffraw and Rhosneigr on the west coast of Anglesey. The map below shows the location of the cottage. Thanks to site visitor Rhys Thomas for this update. In 1851 the Magnetic Telegraph Company was formed. It changed its name in the following year to the English & Irish Magnetic Telegraph Company. The British Telegraph Company was set up in 1853 by the merger of the British Electric Telegraph Company and the European and American Printing Telegraph Company. 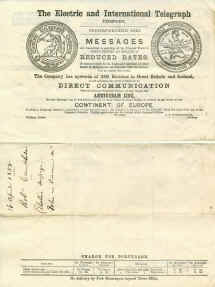 The two companies formed by these mergers then merged to form the British & Irish Magnetic Telegraph Company in 1857. The company had two cables laid; one in 1853 from Portpatrick to Donaghadee under the English & Irish Magnetic Telegraph Company name, and the second for the British Telegraph Company in 1854 from Portpatrick to Whitehead (near Donaghadee). R.S. Newall & Co. manufactured and laid both cables, using CS William Hutt in 1853 and CS Monarch (1) in 1854. In 1870 these cables along with the company itself were taken over by the GPO. The General Post Office acquired its first submarine telegraph cables in 1870 with the nationalisation of the private telegraph companies in the United Kingdom. 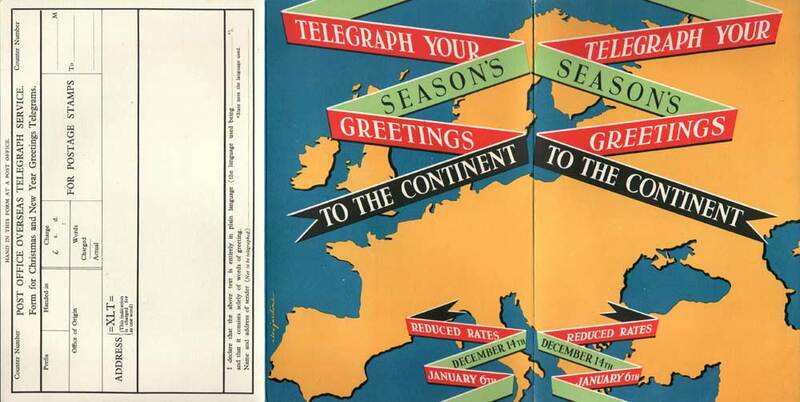 These included those belonging to the British & Irish Telegraph Company, which linked Ireland and England, and the Electric and International Telegraph Company, which owned cables from England to Holland and England to Ireland. Two E&I subsidiary companies were also taken over, one having laid cables between England and the Channel Islands and the other between England and the Isle of Man. 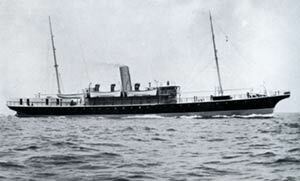 E&I also owned a cable ship, Monarch (1), which was also taken over. On the first expedition for its new owners the ship broke down and was relegated to a coal hulk. In 1890 the GPO acquired the assets of the Submarine Telegraph Company which included two cables to Belgium, four to France, one Jersey - France and the operating rights of one to Germany owned by the Reuters Telegraph Company. In addition the company owned a cable repair ship, CS Lady Carmichael, which was also taken over and renamed CS Alert (1). Over the succeeding years many cables were laid across the Channel and North Sea, the first telephone cable being laid between England and France in 1891. Cables changed from telegraph to unrepeatered co-axial telephone cables, then to repeatered cables and finally fibre optic cables. The diamond shaped "Prohibited Anchorage" signs can be seen above and to the right of the cable hut. In 1900 and 1904 the German Atlantic Telegraph Company laid two trans Atlantic cables from Borkum, Germany, to New York via the Azores. Within twenty four hours of the outbreak of World War 1 both of these cables had been cut and were later used by Britain and France. At the end of the war the Borkum - Azores section of the 1900 cable and the Azores - New York section of the 1904 cable were handed over to the UK. These had been diverted into Porthcurno, England, and Halifax, Nova Scotia, in 1917 by CS Colonia. The other sections were handed over to France who diverted the cable into Brest. In 1920 the GPO acquired another trans Atlantic cable when the Direct United States Telegraph Company was purchased by the British Government. 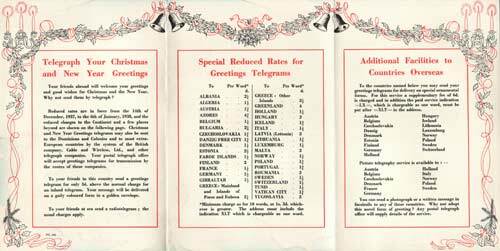 To advertise its services the GPO adopted the slogan "Cable to Canada, Australia & New Zealand via Imperial." This appeared as a postal slogan first used in the 1920's and again in the 1930's and also as an advertisement on a booklet pane. Links to Australia and New Zealand were made via the state-owned Pacific Cable laid in 1902. 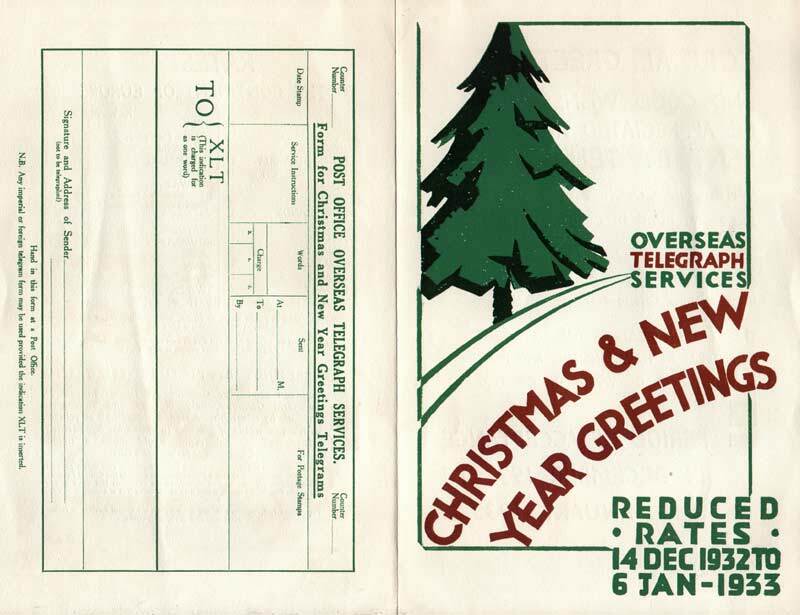 The GPO operated this service until the various cable and wireless companies merged in 1929 to form Imperial & International Communications Ltd., later to become Cable & Wireless Ltd. It retained control of all cables to the Continent and Ireland. The GPO returned to long distance cables in 1956 when TAT 1 was laid as a joint venture between AT&T, the GPO, and the Canadian Overseas Communications Corporation, who owned 50%, 41% and 9% of the cable respectively. (See REPEATERS). TAT 3 was also a joint venture between AT&T and the GPO. CANTAT 1 was purchased from Cable & Wireless and CANTAT 2 was owned by the GPO. They were also part owners of SCOTICE (See SCOTICECAN), and leased circuits in TAT 5 between Spain and the USA. The GPO carried out a great deal of research and development into new telephone cables, leading to the production of a lightweight co-axial telephone cable first used for CANTAT 1. The cable was built around a high tensile steel stress member 0.3 inch in diameter (8mm) which eliminated the need for armouring on the deep sea section, thus reducing the weight and diameter of the cable. Similar cables were developed in the USA by AT&T as well as in France and Japan. Standard Telephone & Cables Ltd set up two factories at Southampton to manufacture the British and American lightweight cables. An improved version was used for CANTAT 2 and subsequent cables. In 1969 the GPO ceased to be a Government Department and became a public corporation known as the Post Office Corporation. Later the telecommunications side became Post Office Telecommunications, and subsequently British Telecom. 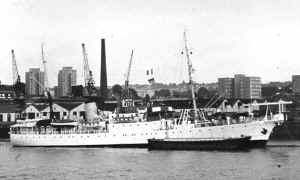 British Telecom was privatised and in 1983 set up BT (Marine) Ltd. to operate its fleet of cable ships, CS Alert (4), CS Iris (3), CS Monarch (5), CS Sovereign and CS Nexus. In 1994 these vessels were transferred to Cable & Wireless (Marine) Ltd., who operated them for the various owners. CS Alert (4) was scrapped in 1995. In 1999 the remaining ships were transferred to Global Marine Systems Ltd.
words or 1s 3d whichever was the greater. Prefix XLT was charged as one word. When the British telegraph services were nationalised in 1870 the submarine cables belonging to the Electric & International Telegraph Company and the British and Irish Magnetic Telegraph Company were also taken over. Also included was CS Monarch (1) belonging to the Electric & International. After one cable expedition for the GPO the vessel was found to be unseaworthy and became a coal hulk. Length 240.0 ft. Breadth 33.0 ft. Depth 17.9 ft. Gross tonnage 1122. Built in 1883 by J & D Dunlop and Company, Port Glasgow. 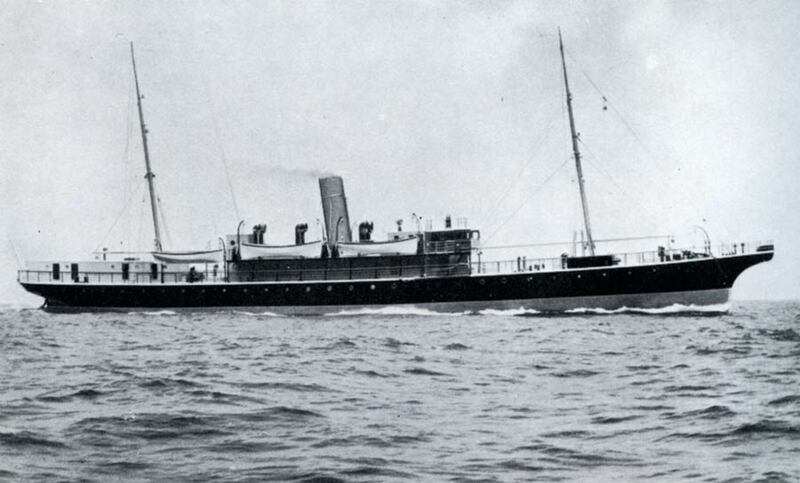 This was the first cable ship designed specifically for the GPO. Experience in cable laying by former staff of the nationalised companies helped in the design. Remained in service until 1915 when sunk off Folkestone either by a torpedo or a mine. Length 222.7 ft. Breadth 32.2 ft. Depth 19.1 ft. Gross tonnage 1150. Built in 1916 by Swan, Hunter and Wigham Richardson Ltd. Built originally as the replacement for Alert (1), the vessel was named Monarch (3) replacing the recently lost Monarch (2). Between the two wars Monarch (3) undertook both laying and maintenance work around the British Isles. In 1944 she was shelled by American destroyers and those working on the deck at the time were killed. In 1945 after repairs the vessel put to sea and struck a mine off Southwold. Length 196.7 ft. Breadth 31.4 ft. Depth 20.1 ft. Gross tonnage 941. Built in 1918 by Swan, Hunter and Wigham Richardson Ltd.
Used for maintenance in UK waters until 24 February 1945 when while working off the North Goodwin Sands she was torpedoed with the loss of all hands. Built 1940 by Swan, Hunter and Wigham Richardson Ltd. Built for the GPO, and sister ship to HMCS Ariel built the previous year. Used for maintaining cables in home waters, between Ireland and the UK and the Continent and the UK. Taken out of service on 1 June 1976 and sold to Van Der Marbel BV, Middenweg, Nieuwekerk, Netherlands for scrap. Sister ship to CS Monarch (5) specifications of both ships is identical. Length 240.2 ft. Breadth 34.2 ft. Depth 15.4 ft. Gross tonnage 1113. Built in 1910 by W. Dobson and Co. Ltd., Newcastle. Chartered from the Lancashire and Yorkshire Railway Company from 1915 until the end of the first World War. Laid cables from the mainland to the various islands in the Orkneys and Shetlands and from Scalloway to Stornoway and across the Pentland Firth as well as a cable to the Pentland Skerries lighthouse. Links were also made to the fleet at Scapa Flow. 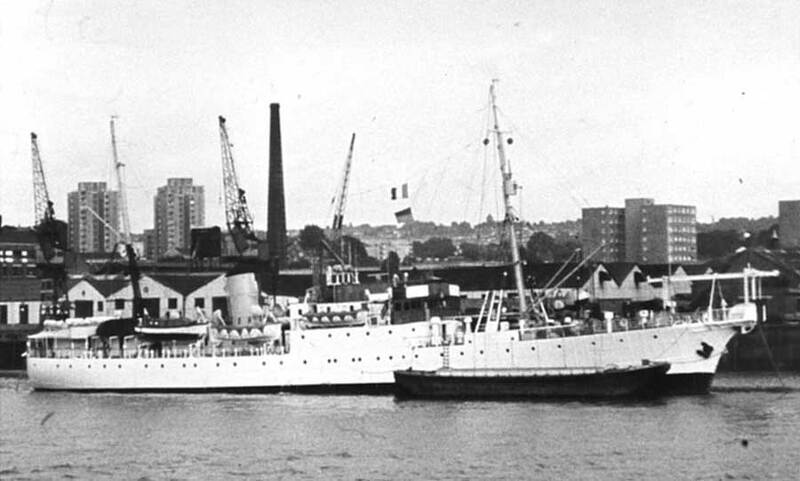 Returned to her owners in 1918 and eventually sold for scrap in 1957. Built in 1906 by Swan, Hunter and Wigham Richardson Ltd.
Another vessel chartered from the Lancashire and Yorkshire Railway Company used for similar work to Hodder in the North Sea and English Channel as well as Scapa Flow. Sunk in the early part of World War II. A converted trawler used to recover a large amount of German cable in the Bay of Biscay for use elsewhere. A North Sea drifter converted for cable work during World War I. Used mostly around the Firths of Forth and Tay. Sold in 1918 to a salvage firm. 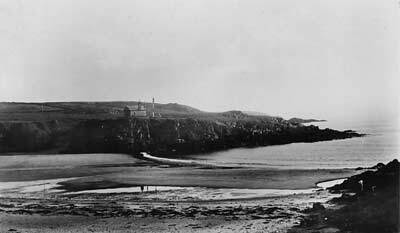 Invercloy (1) was at Scapa Flow in World War I assisting Monarch (2) and later Hodder. Glencloy was at Scapa Flow in World War II and was used to lay cables between the islands and the various Naval bases. Glenaray laid the Oban, Scotland shore ends of TAT 1. Invercloy (2) laid a number of short cables between the Scottish islands. Broken up in November 1967 at Dalmuir. 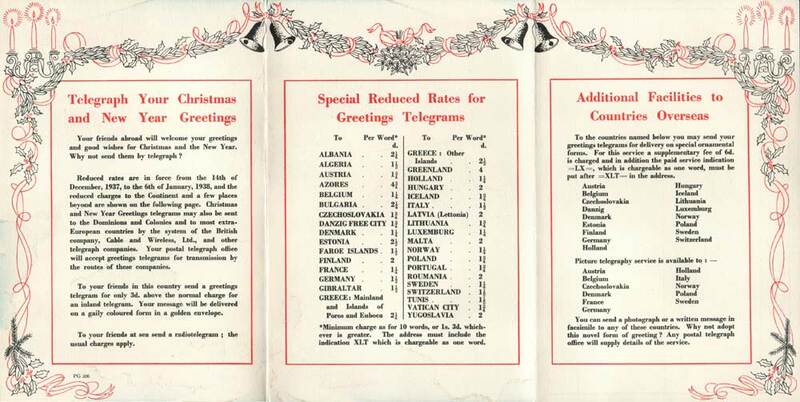 This form was used for sending telegrams either by Cable or Wireless (RadioTelegram). 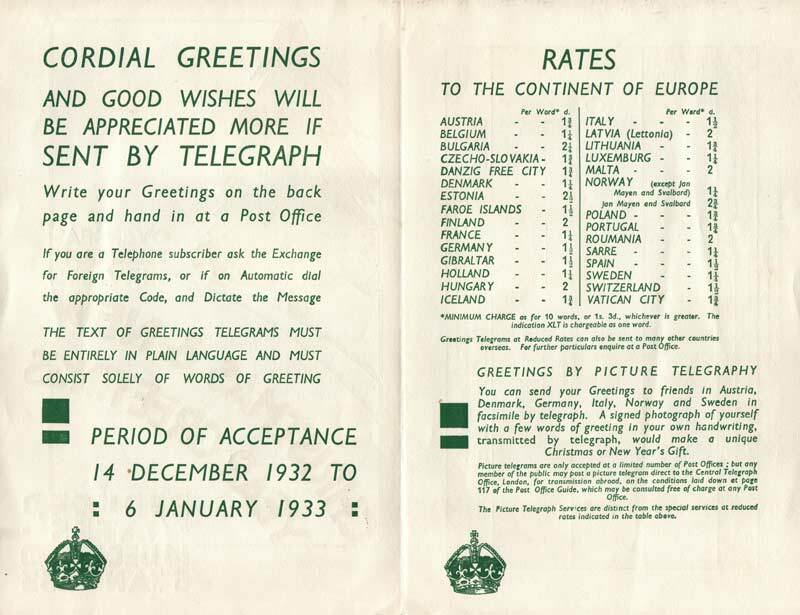 The one shown here was sent by cable to France, the routing instruction being IMP (via Imperial) The type of telegram was a European Letter Telegram (= ELT=). Postage stamps were used to indicate the correct payment had been made, in this instance 7s 3½d (37p). 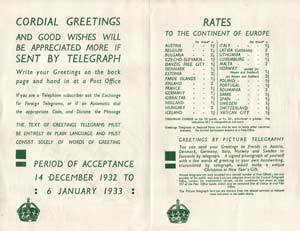 The European Letter Telegram was a reduced rate service for use within Europe, including the UK., which would be transmitted by cable to the addressee's country and then posted on to its destination instead of being delivered by messenger.